We’re enabled across the hospitality industry to know that an eye-catching menu to display your beautiful food, drinks & desserts is ever so important. We offer a range of special finishes and embellishments to help give your menu that creative edge. 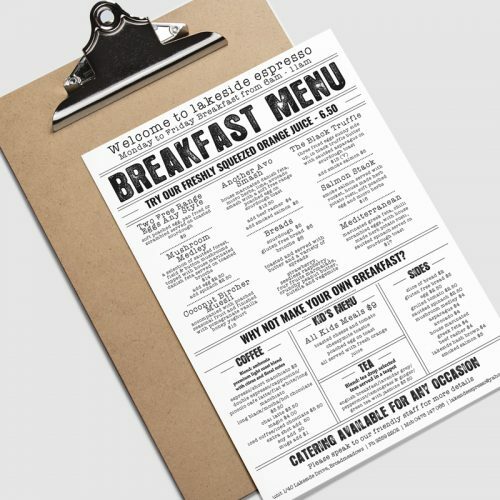 If you’re a restaurant, café, hotel or takeaway then make sure you impress your customers with our wide range of menus. From traditional booklet style menus to something completely different, we’ve got a menu for every occasion and every business. Ask us for more information on your menu printing needs. Now you can print from anywhere. Introducing our Online Print Management System (OPMS) ‘PrintSys’. A new innovative way to organise your businesses printing from anywhere in the country. to suit your business needs. Yes, please send me a sample kit.